It's time for Tablescape Thursday with Susan of Between Naps on the Porch! You probably came here from there but ... if not, make sure to visit Susan and all her talented TT participants. This week's table includes a few pink touches here and there, so I think I'll ask Beverly of How Sweet the Sound to let me join her always-fun Pink Saturday party. Check out the third photograph below if you're "thinking pink" today! Thank you, as always, to Susan and Beverly for hosting. All that glitters just might be faux! One approach to setting an opulent-looking table involves writing large checks (and perhaps hiring a decorator). Isn't it more challenging, more affordable, and, I think, far more FUN to assemble a collection of vintage items from estate sales, antique shops/malls, and thrift stores? That's what I did for this week's table. Some of you noticed that I've been away for a couple of weeks. It was nice hearing that I've been missed. I've missed all of you as well! The first part of my "away time" was spent at a work-related conference. After that, I spent a few days in Harrodsburg, the oldest city in Kentucky. My fifth great-grandfather is said to be buried in the pioneer cemetery there (killed by British-led Indians on an expedition with Daniel Boone, according to family lore). The old cemetery is located in a state park in the middle of town that features a replica of the original settlement, Fort Harrod, and the (actual) log cabin where Abraham Lincoln's parents were married. What does all that have to do with tablescaping? There was an antique mall in Harrodsburg where I acquired a set of china. Is anyone surprised that I came home with dishes? For today's table, I began with the plates and then selected items I thought would create a suitable "environment" for them. 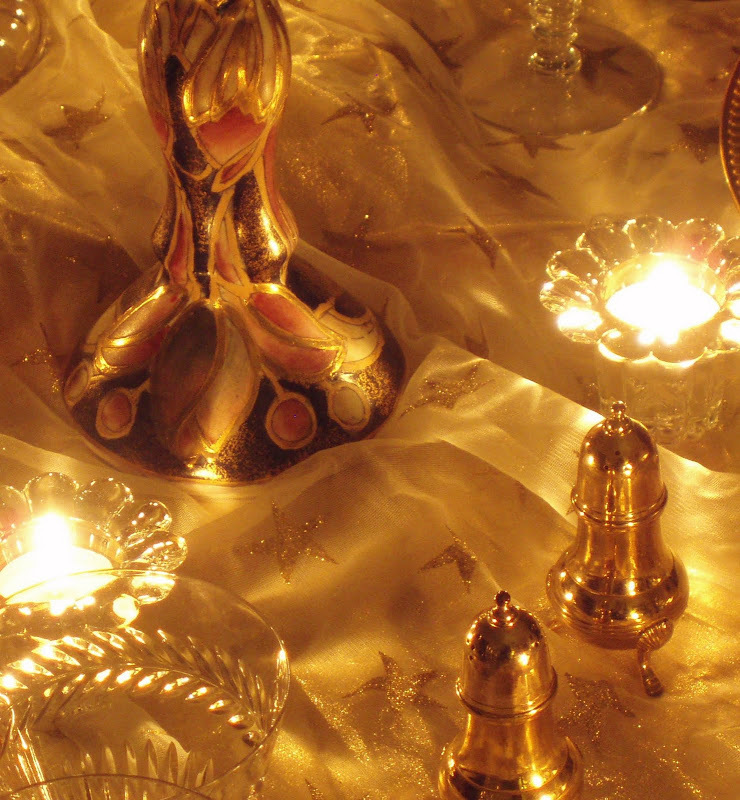 There's a lot of "faux" gold and plated silver on the table. I always compare silverplated flatware to good costume jewelry. It's not quite as special as sterling, but it's affordable and adds so much variety, style, and sparkle ... at a fraction of the cost! I set a table for six in the dining room. I thought the gold tones of the chandelier, the dome above it, and the window treatments would provide a nice setting for the gold and green on the table. 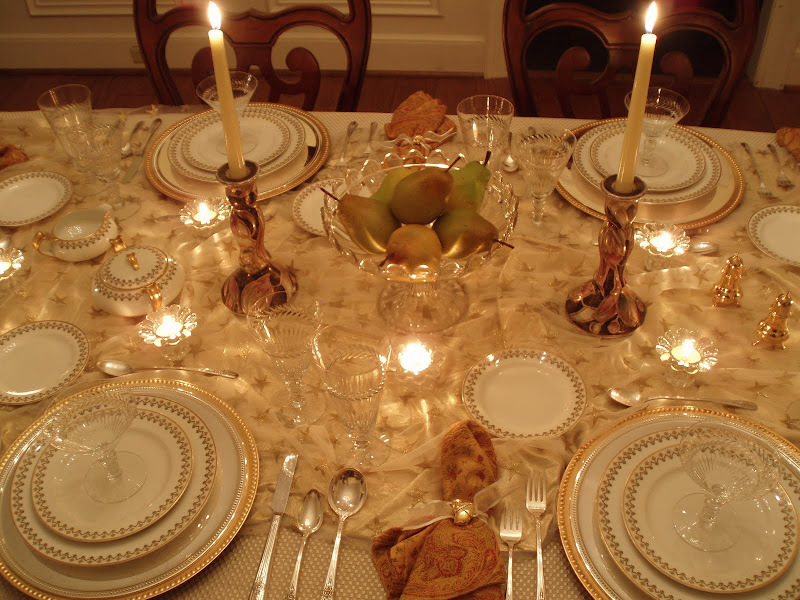 I started with a champagne colored tablecloth and overlaid it with gold lamé fabric. Then I covered that with white tulle printed with glittery gold stars. The fabric came from a salvage store and the total for both pieces was only $2. The crystal is by Hawkes. The stem number is 4074, and it features a laurel pattern and vertical cuts. It's probably from the early 1950's. I purchased it at an estate sale on the second day when prices were being slashed. It's a large set that also includes sherry glasses and juice/oyster cocktail stems. Hawkes, like Rock Sharpe, was an American company that achieved great success in the first half of the 20th century by decorating glassware ("blanks") produced by other manufacturers. Their skilled artisans added crisp (usually geometric) cutting, etching, gilding, etc. Hawkes produced sets of crystal for heads of state and at least two US presidents. The candleholders are from Goodwill, and cost $3 for the pair. 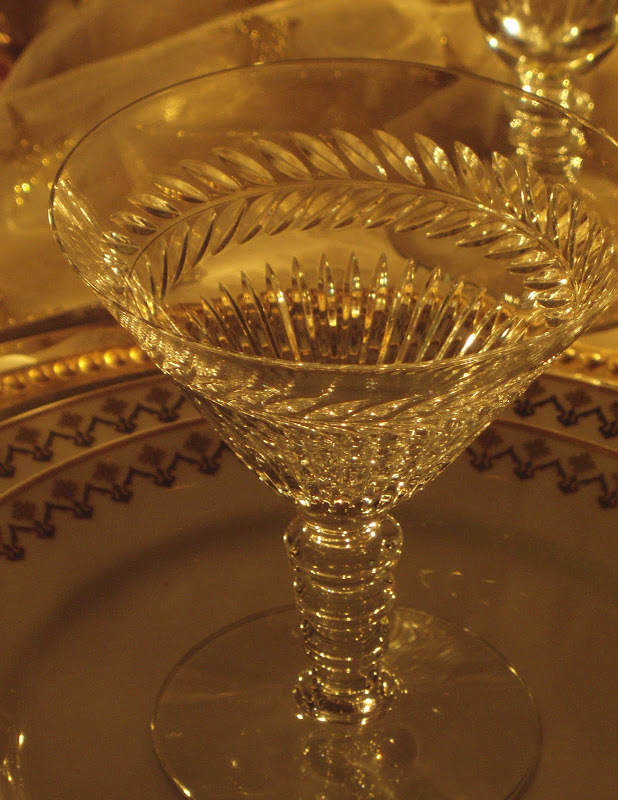 The crystal compote was purchased at an indoor flea market in Harrodsburg for only $8. I have no idea who the manufacturer is. I suspect that it isn't old, but I like the shape, it's clear, and it sparkles very nicely. The plates are by Haviland. I haven't researched the pattern, but the backstamp includes the following words: Haviland, Limoges, and France. It's not a complete set, but it has enough dinner, salad, and bread plates to serve ten ... plus several extra pieces. 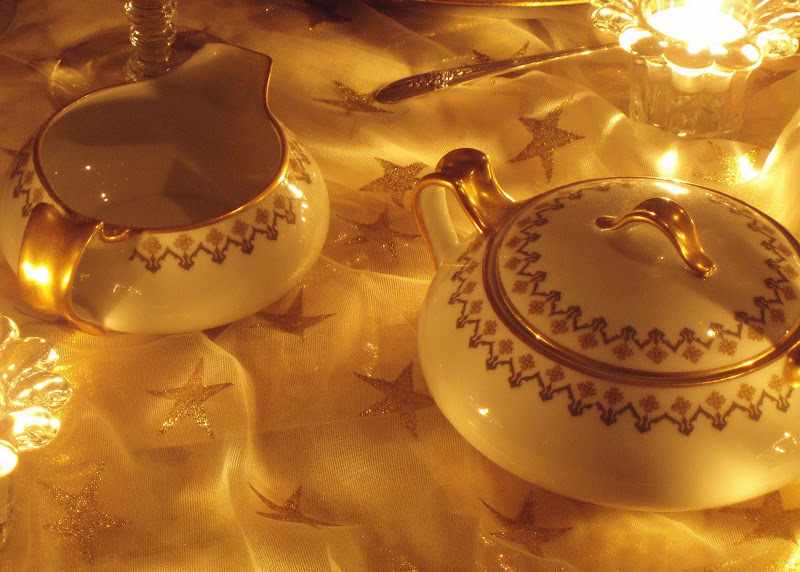 My favorite piece is the sugar bowl ... lots of gold trim! 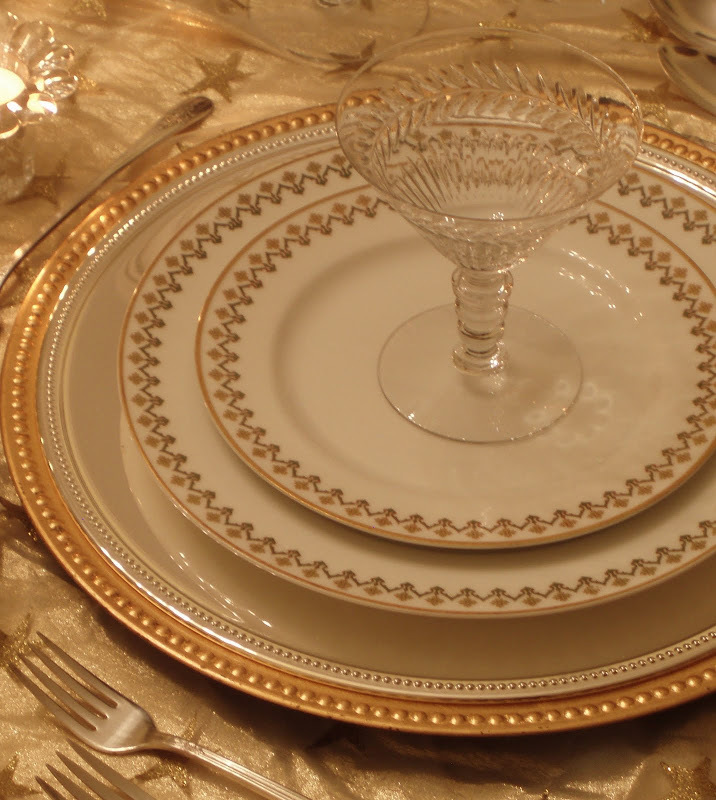 Have you noticed that modern dinner plates are larger than most vintage ones? It seems that plates have been "super sized" along with restaurant portions and appetites. I recently read a tip for people dieting that suggested using smaller plates that appear fuller (and supposedly more psychologically satisfying) with far less food served on them. I used a double layer of charger plates to add interest and balance. The gold colored ones are acrylic, and the others are silverplated. The acrylic chargers are widely available at department/discount stores (mine are from Goodwill). The silver ones were on sale at an antique mall. I was planning to do an arrangements of perennial mums from the garden, but it had rained ALL day and everything was soaked. I decided to go with pears ... faux ones at that. I hope you're not disappointed. I promise we'll have fresh flowers the next time you stop by for dinner! 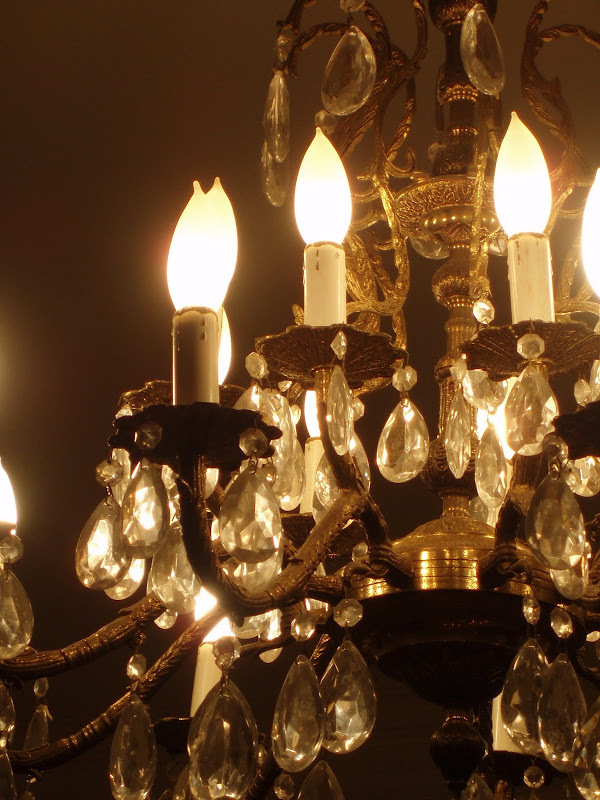 The chandelier has a dimmer switch. 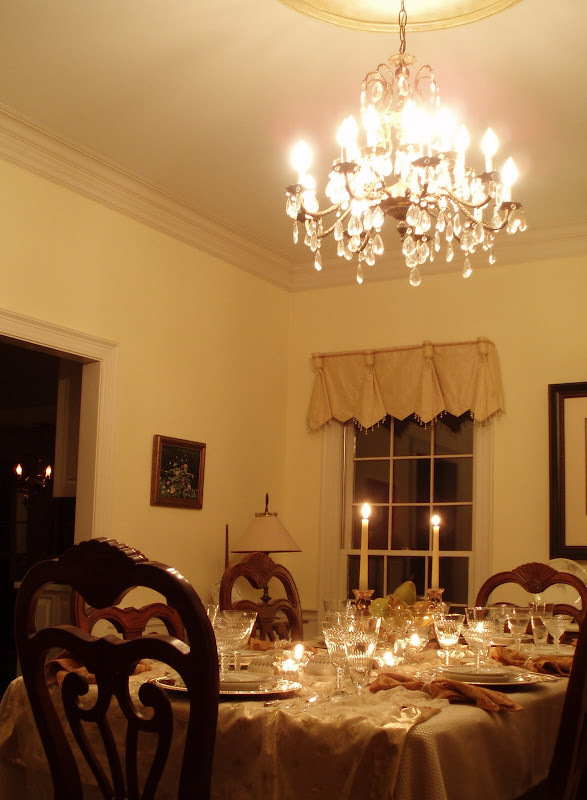 I think the ability to dim the lights is essential to creating a mood of comfort and relaxation during a dinner party (or any time at all!). Here's the table with the candles lit and the overhead lighting halfway between bright and dim. And now with the lights much dimmer. Quite a difference, no? With the layers of fabric, I was trying to create a bit of shimmer, a gossamery look. What do you think? Did it work? Don't tell my other crystal patterns, but I think this one is my favorite! The ornate but clean-lined stems are what I find most appealing about them. I also enjoy the way the wheel-cut designs reflect light from the candles. Here's a closer view of the sugar bowl. 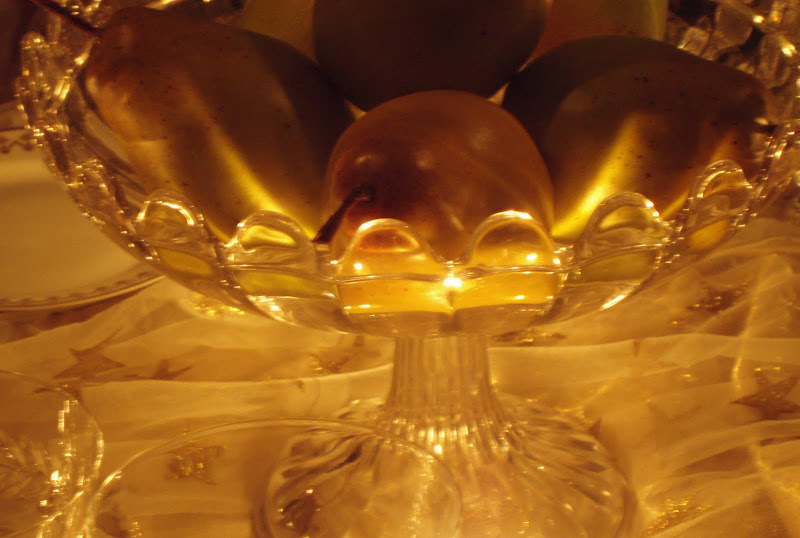 The pears lit by the tea light candles below ... not bad as fakes go, are they? A closer view of the thrift store candleholders. I've finally found a use for the gold-plated salt and pepper shakers. They never quite seemed to go with anything else I had. The "swinging from the chandelier" view, à la Julio and Susan! The votive holders are "junk store" finds that add lots of sparkle at minimal expense. A closer view of the crystal pattern. A few of these glasses had tiny rim chips (flea bites/chigger bites). Smoothing them with a file was my first attempt at making damaged glassware usable. They're pretty fragile. I used too much pressure on one of the oyster/cocktail stems, and it shattered in my hand. I was lucky ... no injuries (just wiped a tiny tear and moved on to the next one), but be careful if you try it at home. 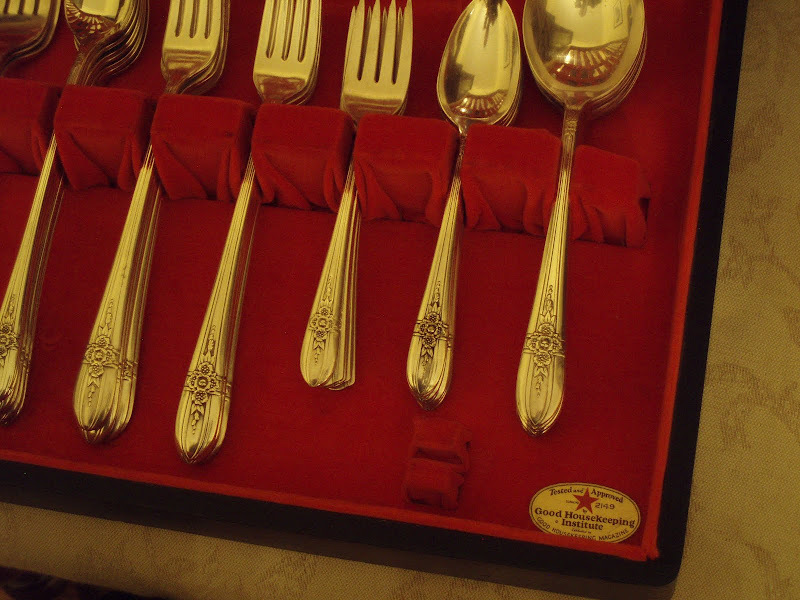 The flatware is "Triumph," 1941, by Rogers/International. I found it on sale at an antique mall in a booth that was closing. It's the grille/viande style (long handles on the knives and forks). I included the round soup spoons in the place settings just for fun. I think they're pretty and wanted you to see them! You've seen these napkins before HERE. I purchased them at an estate sale. They're a rayon blend fabric that feels very soft and luxurious. 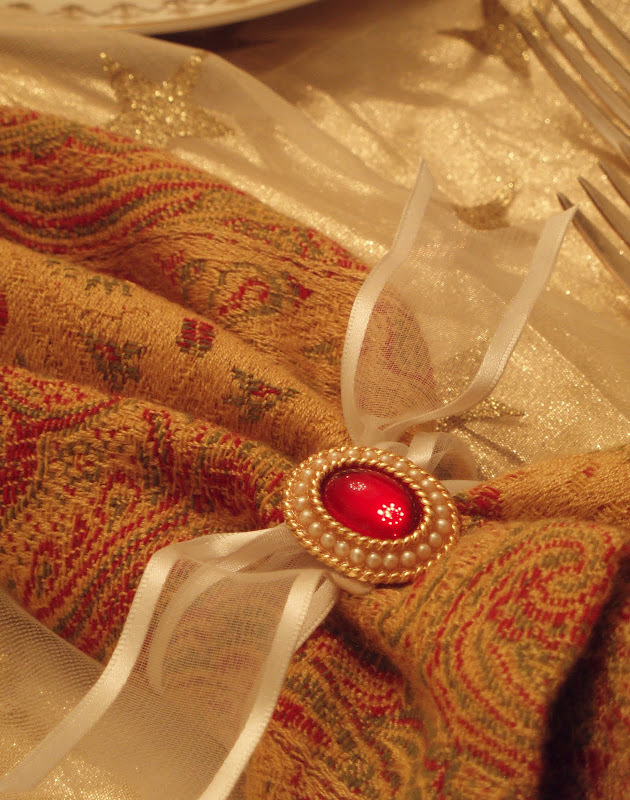 The "napkin rings" are easy to make using wired ribbon. Each one takes about 1 foot of ribbon (I didn't measure). I tied a double knot and added clip-on earrings as ornaments. The earrings were new (price tags still on them ... up to $20 per pair ... Anne Klein, etc.). They came from my favorite local junk store ... 3 pairs totaled only $1. Sometimes I like the flatware chests almost as well as what's inside them. This one showed signs of age and had numerous imperfections. I matched the color using artist grade acrylics and made the scratches disappear. Voilà! 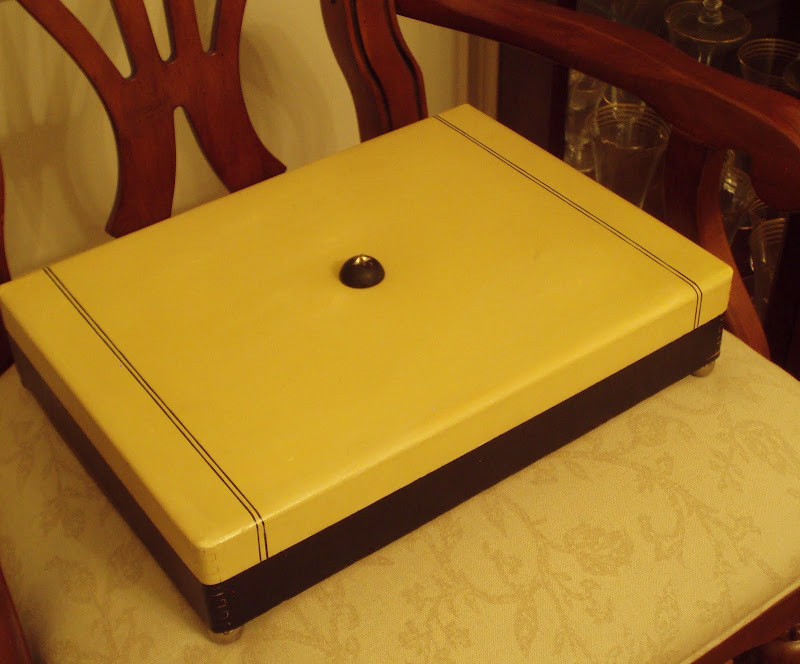 The tarnish-resistant lining was in near-perfect condition. And ... it has the "Good Housekeeping Seal of Approval!" How nice is that? The three main "ingredients" total $112.50. How's that for affordablility? One place setting of new department store china can easily cost far more! So there you are! You have been missed, but what a great trip with so much history. I would love to research my father's side of the family. Your china is beautiful. Haviland is my favorite oldie. I am very surprised there is no pattern name. Maybe it was made during the split and family feud era of Haviland. HOW do you ever know how to identify old crystal? I have some I have no clue about and would love to research it. Elegant as always! Almost forgot, gorgeous chandelier! Elegant, elegant, elegant!! 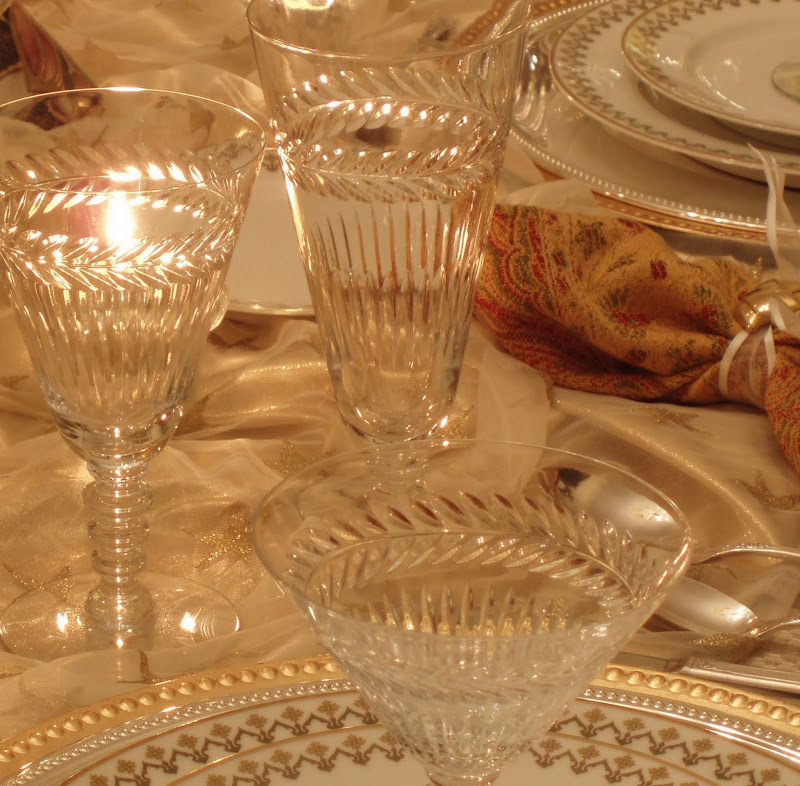 The dishware is stunning and the Hawkes crystal is gorgeous. The way you put this together is nothing short of magnificent. I know, I'm gushing a bit, but this is gorgeous...and yes you were missed. Missed you, Bill! This table is absolutely amazing. I love the china! Gorgeous table and the lighting and photography is wonderful. Ooooo, yummo-liscious!! I adore everything about this table, Bill. :D I love the richness of the entire look. 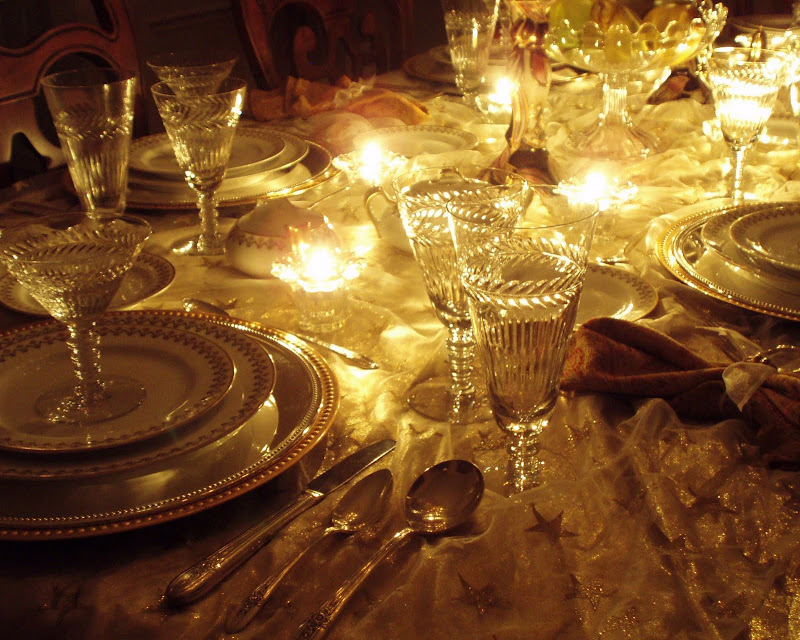 The sparkle, the gold, the elegant table linens....everything! I have missed your posts on TT & am glad that you are back. Glad you are back. 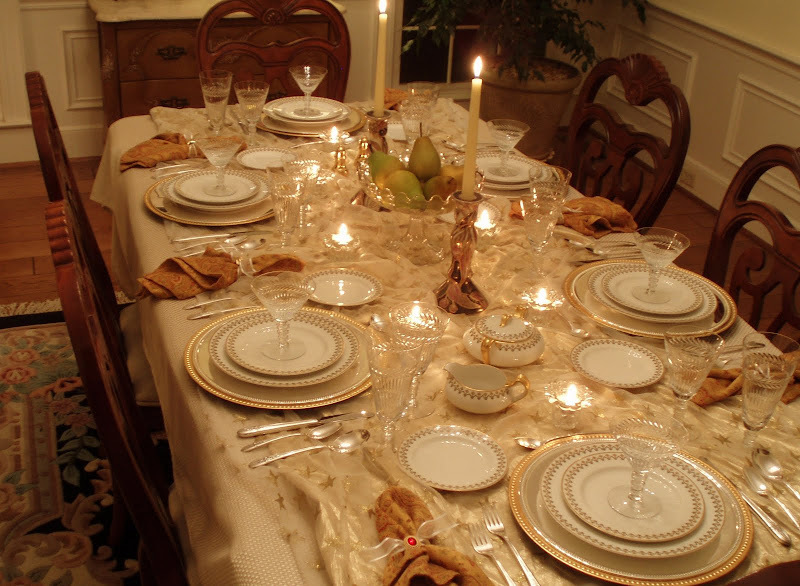 I always enjoy your tablescapes, they are so well laid out and complete. Dear Bill, Yes I have missed you and your wonderful tablescapes and wondered where in the world you were. Possibly buried under a pile of fallen dishes and couldn't get up. You get the best deals don't you. I love seeing others get happy. Your chandy is fab! and the Hawkes crystal is BEAUTIFUL, Love it. It looks substancial and I like that. The thought of a glass shattering as I'm taking a sip has cured me of my love of thin blown glass. I had it happen to a friend. Your picture of the table with the lights low is breathtaking. 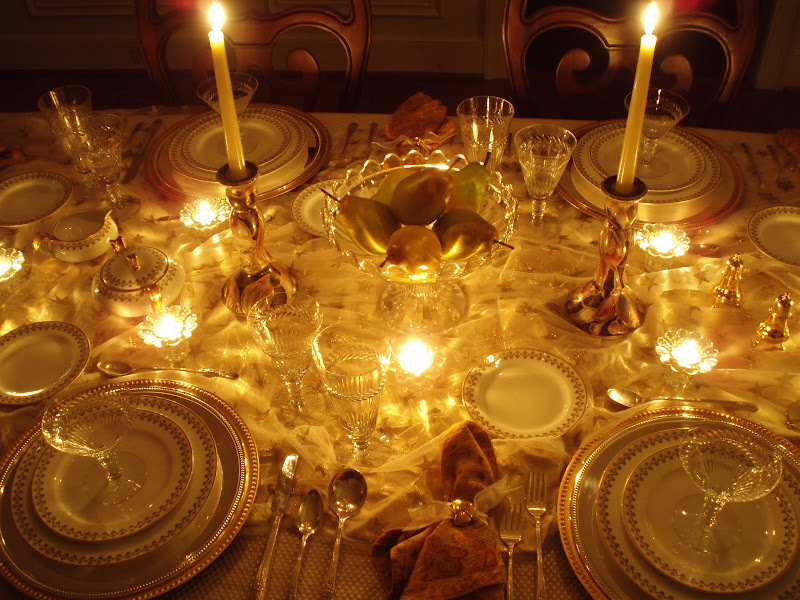 I adore it when I am invited into a home like yours and as I enter the diningroom the table takes my breath away. A good night is to be had for sure. That is beautiful! When I come for dinner, I won't bring my 4 little gkids with me! Really, everything is just perfect! Welcome back, Bill! Your tablescapes never disappoint, and I always look forward to seeing them. This one is exceptionally beautiful! 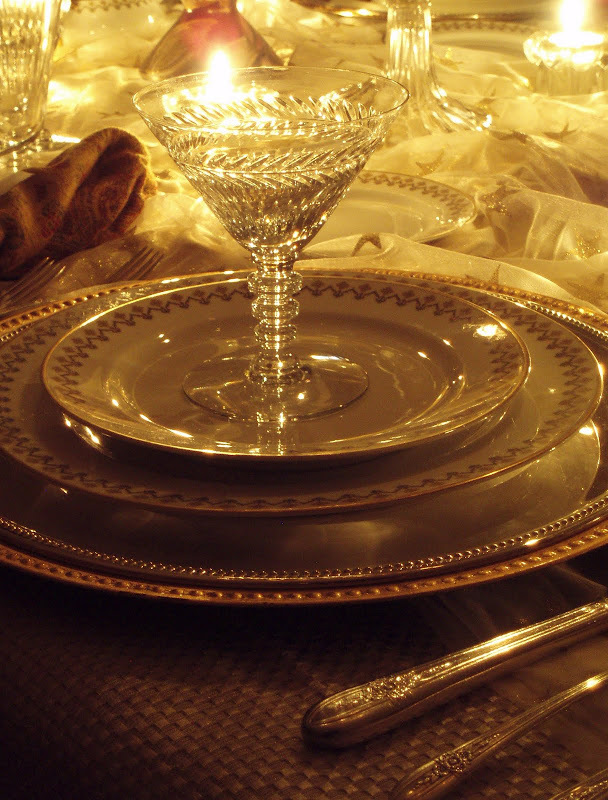 The gold is so elegant, and your china and crystal are gorgeous. Layering the tablecloth with the gold lamé fabric, dimming the chandelier and lighting the candles creates the perfect ambience. Wonderful finds that you beautifully pulled together! Welcome back! Bill, you are king of elegant! Your table is beautiful, as always. I can't believe the deals you get on your china, crystal and flatware...wish there were places like that around here. Magical table, Bill. Thanks for sharing. 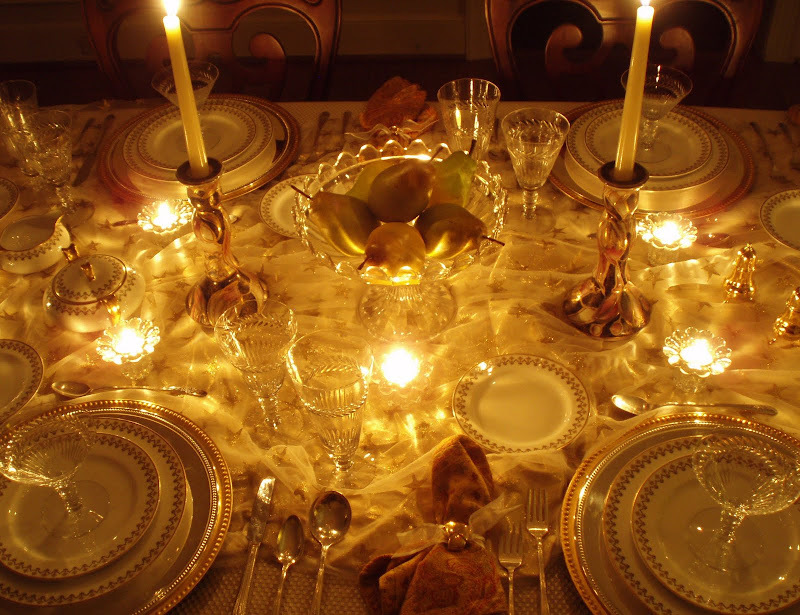 What a beautiful table, and it looks even more stunning by candlelight. All your golds look ravishing together. Thanks for sharing and happy TT to you! Just spectacular! I have drooled over every single photo. I thought it could not get any better and then I came to the candlelight shots. You achieved the "wow" factor and then some. I love all your crystal and stemware. This is just beautiful! What a sophisticated and elegant setting. I really love that cutlery setting. I have only just discovered this beautiful blog but will be back to see more as soon as possible! Yes, you were missed! Your TTs are like no other, and this one is no exception! The fabric overlay is perfect for the china, so is the crystal! Bill, I'm so glad you posted tonight. I had told myself earlier today that if you didn't post tonight I was going to email to see if you were okay. You've been missed! Brilliant tablescape, as always, and what great finds. what a fancy set of dishes. Love , love the sugar bowl and the salt and pepper shakers. I like the gossamer type tablecloth! !--cool.Nice to have you back! Ohhhhh,AAAAAhhhhhhhh,OOOOOOOOhhhhhh! Opulence and style. The china- limoges is gorgeous. I have a couple of old limoges pieces. I love anything lomoges! The crystal is perfection. You put this table together so skillfully, these fabulous pieces shine! I for one am glad you have returned and delighted us with a spetacular tablescape today. 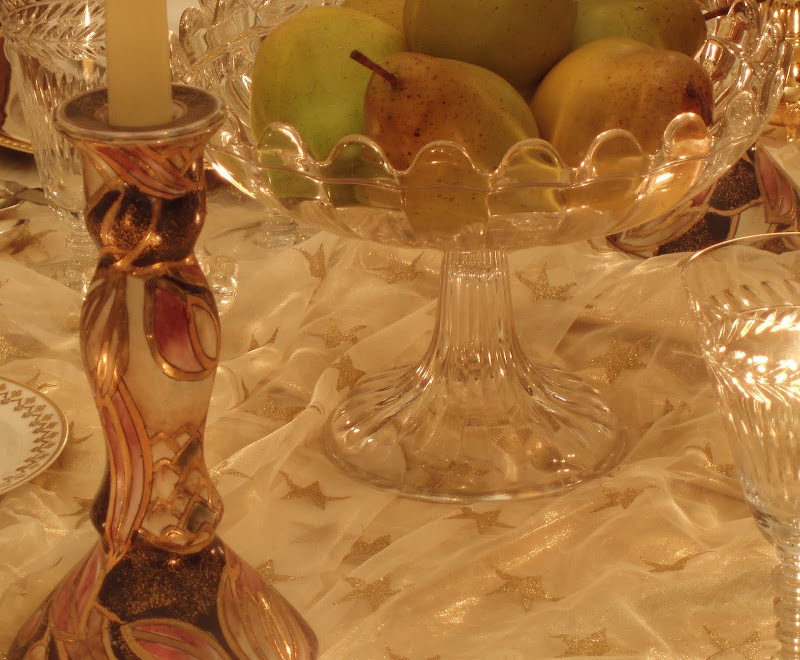 It is proven time and time again that some of our prettiest tables are set with treasures from a thrift store. Oh wow, do I love that crystal. The whole look is truly stunning and you have captured the feel so well with your pictures. Your faux pears are fine with me as I'm using them on my table this week too! They look great and last forever! Absence makes the heart grow fonder. But don't push your luck! Glad to have you back again. I love the gossamer look of the fabrics. I have done that on some tables at Christmas and it look fab. Keep up the good work. It is always so nice over here. You do a great tablescape! Love the "bling bling" effect! Especially with the layers of fabric! I have done that before and put white mini-lights underneath the tulle layer, creates a great effect! 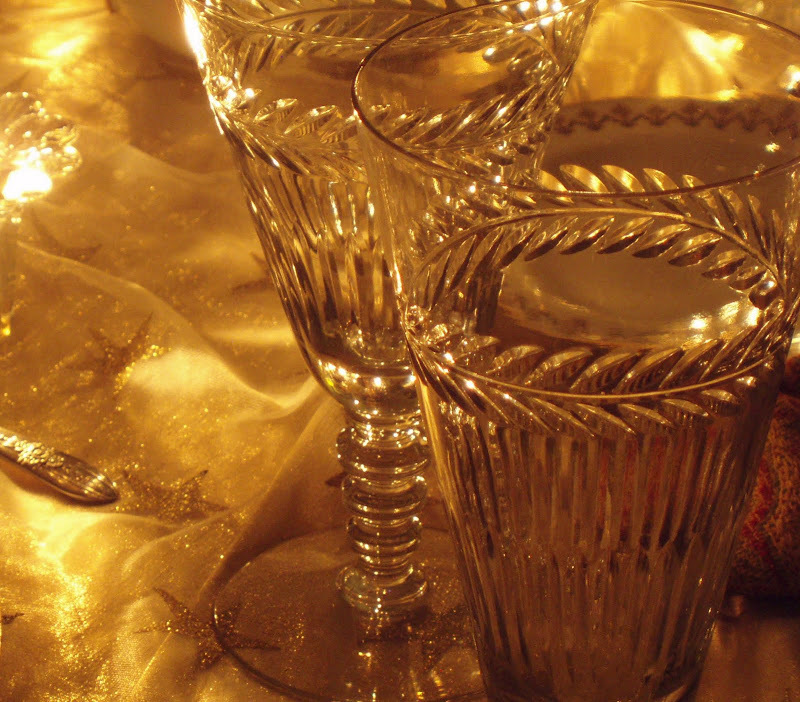 That stemware is so sparkly, just love it! HI Bill what a great deal. I need to go out to some flea markets! I love how you had the history at the beginning of your TST. That was so interesting to me. I do Genealogy and love History. Family tales or folklore is wonderful stuff. You really have a way with words. I love how the words just flow onto the blog and it's so fun to read about each piece of this or that. Your TS is lovely as always. I love the plates would look wonderful with my Royal Albert Flatware. You have high ceilings too, they are so nice, but chilly in the winter. We have them too! have a wonderful evening. Thanks for sharing your magnificent TS! Bill, this is just wonderful! And I can't believe you got that Haviland serive for $42!!! You are kidding me! One plate should be that much. WOW! I want to go shoppig with you. Love how everything glistens. 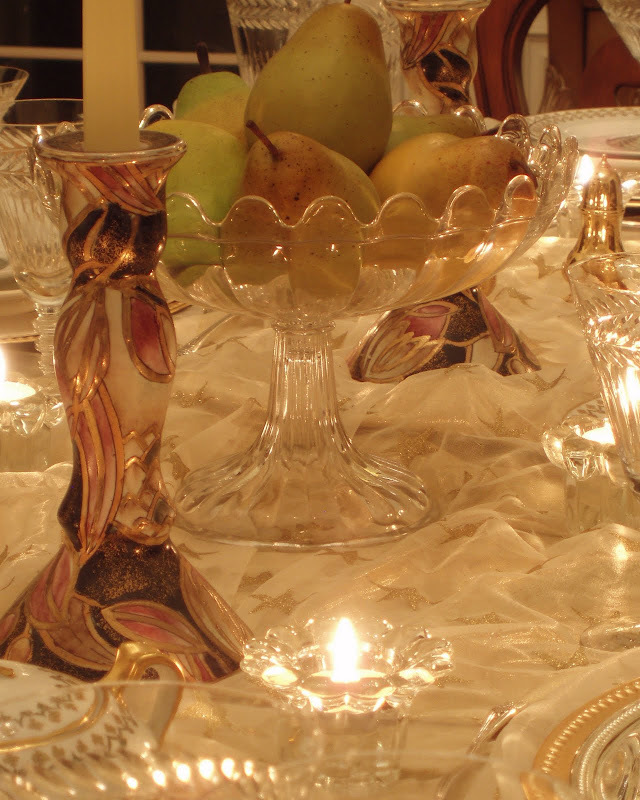 It's so lovely with the candlelight, and I actually think the pears go well with the gold china. 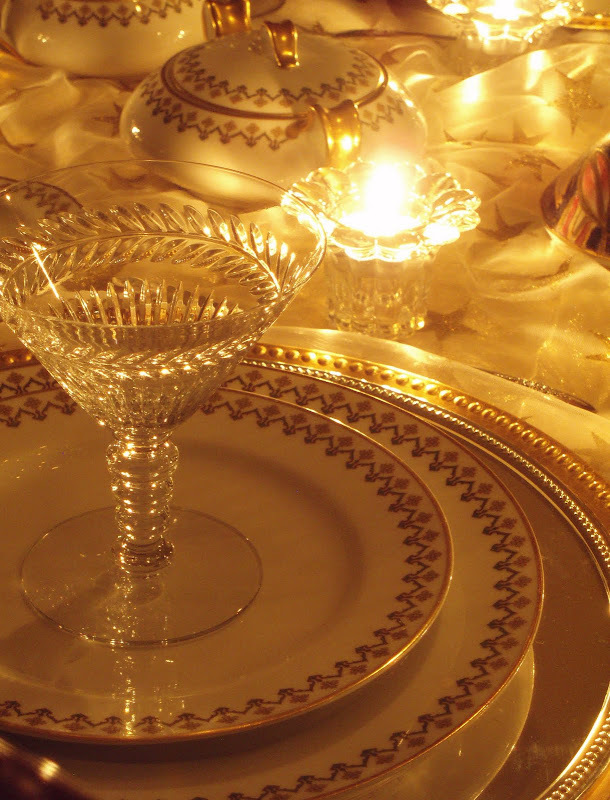 I adore that cut onthat crystal, too, and I like how it echoes the pattern on the china. Wonderful job, and WELCOME BACK! Stunning & elegant. Beautiful photos. Great job!!! 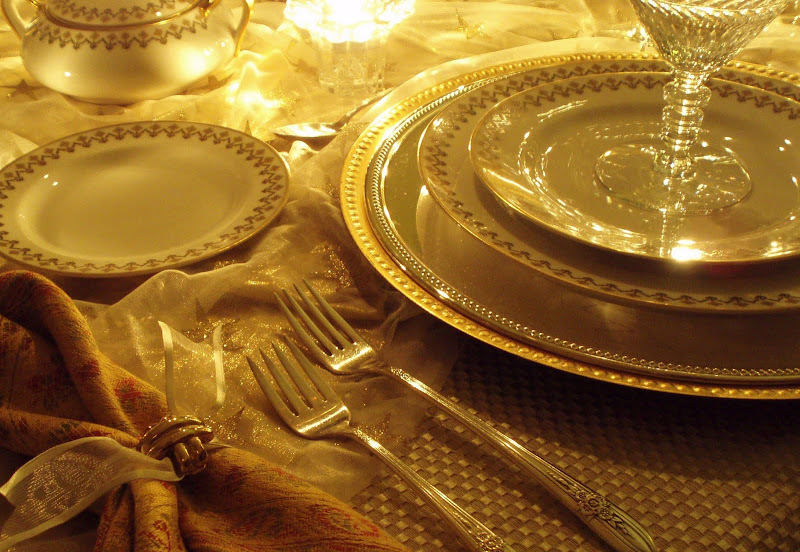 Your table is lovely -- but they always are -- and I adore your new china -- white china with a gold band is my second passion (after blue and white!) And the pears are a fine substitute for wet mums! BTW, you were missed -- glad it was meetings and travel! This is lovely! I sure missed you the past couple of weeks - so happy you're back with us! Love your new china and crystal ....now if you're looking to get rid of any of your old "unloved" pieces...just let me know!!! You always "class up" the place. Your table is absolutely lovely. I love the flatware and I have a similiar find of the same brand but different pattern. Thanks for sharing and have a great day! I love it all and you did a magnificent job here. Your home is the first one I always visit coming from Susan's. Always enjoy the beautiful things you put together and appreciate the history & info, as well. You do inspire me with all your ideas. Thanks so much for taking such care with all your pictures. Thank goodness you are back - I thought I was going to have withdrawal symptoms again. 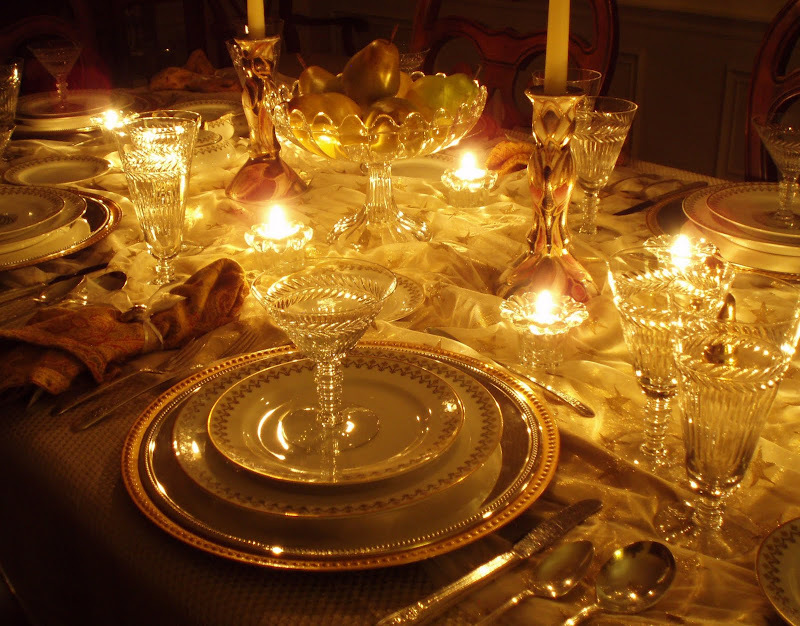 Your tablescapes are truly fabulous and I wait each week to see yours first. You really should be published in a magazine. Thanks for another spectacular job well done. Pretty table. So shimmery. I really love your chandelier. I noticed you didn't post a tablescape last week. What a beautiful table! Your dinnerware is gorgeous, and your photos are truly awesome. I am just in awe of your collection of glass and crystal! It is so beautiful! Your photos here are truly outstanding. And that's one of the things that always matters to me. Just delectable photos, Bill! You framed the shots perfectly. Bill it's a thrill... to have you back... this post did not show up on my blog list... what is up with that... it is gorgeous, my kind of setting... dripping with style and elegance like fine jewelry from Tiffany's, glittery frosting. Stunning, now get yourself down to Texas for some of my chili! Oh what a pretty, pretty table! I cannot believe the buys you get at estate sales -- I need a course in Estate Sales 101 from you! 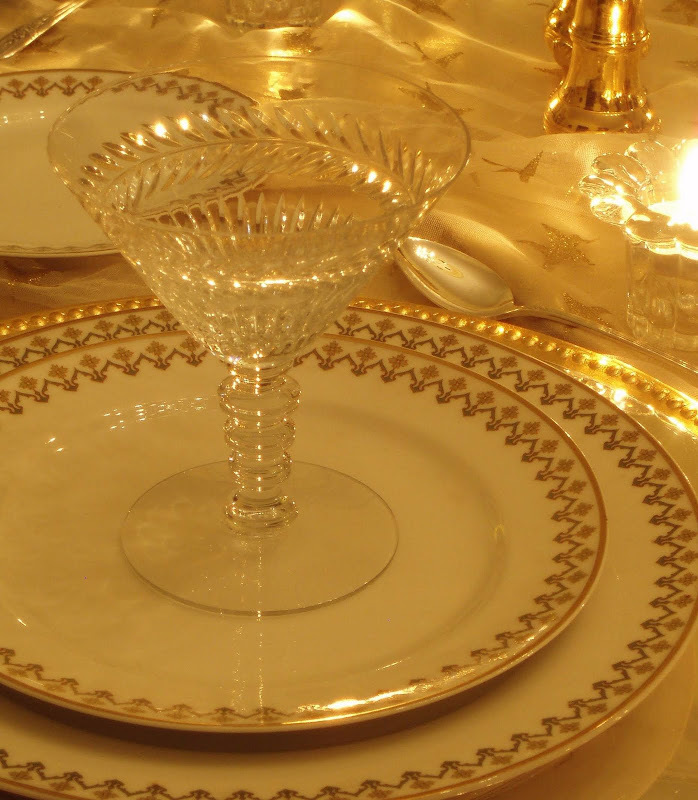 That Haviland china is spectacular! And the stemware? Beyond gorgeous. I love the old silverplate. I began on Ebay a few years ago looking for sterling, but I fell in love with the vintage silverplate -- but then I guess that makes sense, as I adore costume jewelry; not as nuts about the real stuff--- too much responsibility! Wonderful table, thanks...and BOO!!! Happy Halloween! I think this might be my first time visiting your blog. Love your china. And those long handled forks are wonderful! Thank you for sharing your beautiful table. Oh, and I love the idea of using two different chargers! Again this post did not show up on my blog list, I wonder why?? Welcome back Bill, from all the comments you can see you were greatly missed by all your fans!! I love everything about your tablescape from across the pond. The pears look so realistic, I have some fresh one that look exactly the same and if we don't eat them soon will go off whereas yours will last for years!! All great finds, you must be great to go shopping with!! "I recently read a tip for people dieting that suggested using smaller plates that appear fuller (and supposedly more psychologically satisfying) with far less food served on them" I usually serve Phil's meals on a small plate for the reasons you said above and I think it works!! Hi Dear Bill! I have missed you but so glad to hear you had these wonderful trips! So much history and your family involved, how marvelous. Now I must say you are some shopper! I adore your new china, crystal and silverware! You have outdone yourself on setting this glorious table! I love how you prepared the tablecloth with the other fabrics! Shimmery sparkly - just like you wanted. Your centerpiece with the pears in that lovely compote looks just perfect to me. Adore the salt and peppers! I have seen some of these in an antique shop and almost bought them, but didn't know when I would use them. You may have helped me change my tiny mind! :) You are so good at getting wonderful bargains and your table setting truly looks like a million! You are certainly the best! Glad your back and I'm so glad I didn't scare you too much! :) Oh, I love your chandy, it looks alot like mine! Hi, Bill, thank you for coming by & leaving such a nice note! 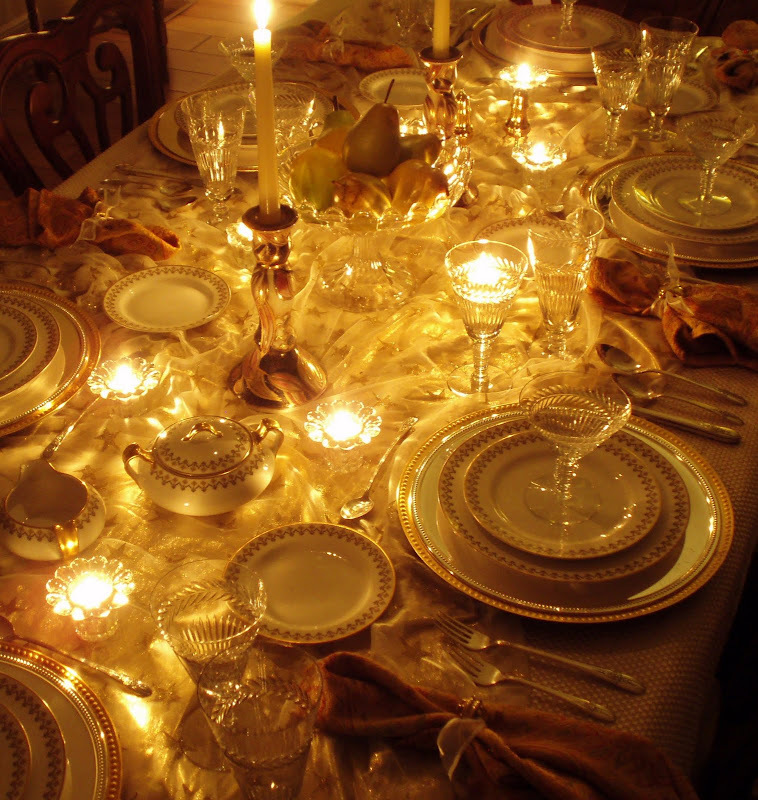 WOW, you set a gorgeous table, it is just spectacular & your whole dining room is so, so pretty. You have amassed quite a lovely collection of vintage table ware and it all goes together perfectly. I wish I enjoyed tablescaping like all of you do, but I really don't get into it that much. So, my tablescapes will probably be few & far between. :) And I don't have nearly the collections that many of the dish-a-holics around blogland do. :) I sure do love my new brown/white though. And you're right about the plates being smaller, they really are. You were missed and thanks for stopping by. Almost missed this post, as your blog still does not update on my Reading List. I need to take some time and look into the situation and see if it is something on my end. Sounds like you had a great trip with some fun time mixed in with business. Another beautiful table - you did a great job as usual. As always you did a superb job. Love the table setting, and the stemware is exquisite. I so love the candle holders, they are so beautiful. I really loved the idea of the double chargers, gave a beautiful and elegant touch. I love the netting type fabric that you chose with the stars to layer your tablecloth. Very interesting. Thank you for stopping by and for your kind thoughts of Amy. She had suffered so much, it wsa time to go home. I know she has hung her star out, and that she is dancing the streets of gold, and that she is singing and giggling again. She missed her voice so much. She loved her cards Bill, that was the kindest thing you could have ever done for her. Thank you from the bottom of my heart. Happy Halloween. I hope you have lots of little Trick or Treaters. We usually have about 130-150 come to our house, so I am stocked and ready to go. Oops! I forgot to tell you that the clip on earring idea is brilliant, and I may have to borrow that idea some time. I love looking at all of your tablescapes... every single time! So glad you shared with us this week. Thank you most sincerely for your nice comments on my blog this morning. Again...another WINNER! Because of you, I am going to Goodwill tomorrow morning. And if there are any tag or estate sales on my way there, I hope I find something. That china you featured is so very beautiful...and so is the price you paid! LUCKY YOU! And talented you, also! I was just stopping by to wish you a safe and happy halloween and am so glad I did! for some reason my blog roll with you on it isn't updating me on your latest...I'll have to fix it. This table is fabulous! I will have to comeback later and take a closer look. In the meantime, you have a wonderful Halloween. Your table is so pretty, one again. I like the layers used with the tablecloths as well as the setting. I've been looking for silverplated chargers...not much luck. I think I'm going to use round trays. I seem to find quite a few of those. You have such great luck at estate sales... Thanks for sharing! What a beautiful table. Thank you for sharing it with us. Happy Pink Saturday. Such a sumptious table you have created to share with us today. I particulary liked the layering of plates & the napkins rings. 2 ideas I shall certainly be copying from now on. Sorry you had a mishap when visiting me in Normandy last week but so glad you stopped by, however briefly! for a lil bit over $100.. you got all these? I gasped!!! too beautiful and what great finds! love how you set up the table! stunning.. I was thrilled to death to find a new post from you! It's been tooooo long since I had a Bill fix!! I do believe you outdid yourself with this post and I didn't even think that was possible. Exquisite! I can't begin to imagine what your holiday decorating posts are going to look like but I'm so anxiously awaiting them! So glad to have you back! You've been missed! But wow, what finds while you were away!!! I love it ALL. I can't believe the prices!!!! I left you a message Thursday, but I really don't know where it is! I wanted to let you know your tablescape was just beautiful, loved the stemware and the flatware and you really found some great deals. Thanks for visiting and your wonderful comments. Chili night was great as usual, lots of food, laughing and girl talk. Hope you visit again soon! I must say that I love every piece and the overall vision is magical. Those gold stars just floor me. Glad to see you back! You have simply the most glamorous pieces! 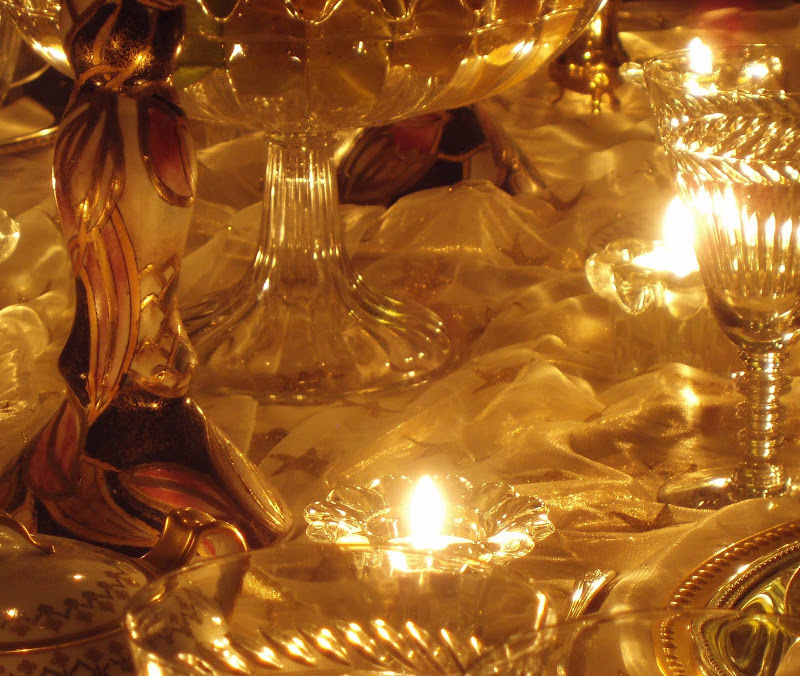 Your table is absolutely opulent! Thank you so much for posting. P.S.- I'd hate to come up against you at a sale! I worked at an auction house for years and know the tough bidders are the ones with the best 'eye'. That would be you. I agree with all of the superlatives above........ you are soooooo talented, thank you for posting these beautiful photos. I can see this tablescape in Buckingham Place! Bill is Back! Hooray! You were missed and you certainly were worth the wait with this beautiful post. I love the thrift store candle holders best of all!
" My fifth great-grandfather is said to be buried in the pioneer cemetery there (killed by British-led Indians on an expedition with Daniel Boone, according to family lore)." My family knows your family! My great-great grandmother, Mary Boone Gersham, was Daniel Boone's cousin! And yes, lighting is EVERYTHING. I really can't get enough of your blog. BTW, on my blog, I've mentioned The Gersham line that I'm from, and even Daniel Boone. Funny you said something about it too. (And I found that you had.) The info is on the right hand side with Gersham's portrait from the 1500's. So many inspiring pictures, and so apparently affordable to get such an elegant look. Not sure if estate sales exist in the UK, but am gonna see if I can find some! Well finally ! a blog after my own heart- same interests, although not so fine tunes as you ! What a super deal was that Limoges !! As for plate sizes- you might be younger than I, but back in the 1960s, 70s and 80s when a girl got married, she went to the jewelry store or local dept. store and picked out a china pattern. They were usual English patterns, like Coalport or Spode, and American patterns like Lenox- these plates were all traditionally 10 inches to 10 1/2 inches. Larger exclusive stores in big cities had patterns made in France like Bernardaud and Haviland Limoges especially made for the modern American market, and those dinner plates were made extra large to match the English and American sizes. However the traditional European size dinner plate is much smaller- more like 9 inches. The old Limoges dishes you bought are those size and modern German dishes for dinner are still also only about 9 inches. The exception would probably be Villoroy and Boch made for the American market which would be made to suit the American taste for large plates. "A Vision in a Dream. A Fragment"